Over the next decade, the most important trend for communications service providers (CSPs) will be fortifying and transforming their networks to connect people, places and things. Carrier Ethernet, essential to network transformation, enables service providers to expand their customer reach, increase capacity to meet digital demand and to benefit from Ethernet’s favorable cost basis. The Neustar suite of access services solutions eliminates the complexities of access provisioning to accelerate ordering cycles, benefiting both access buyers and sellers. 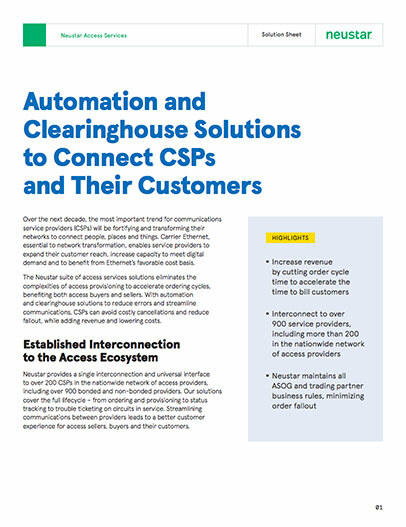 With automation and clearinghouse solutions to reduce errors and streamline communications, CSPs can avoid costly cancellations and reduce fallout, while adding revenue and lowering costs. Neustar provides a single interconnection and universal interface to over 200 CSPs in the nationwide network of access providers, including over 900 bonded and non-bonded providers. Our solutions cover the full lifecycle – from ordering and provisioning to status tracking to trouble ticketing on circuits in service. Streamlining communications between providers leads to a better customer experience for access sellers, buyers and their customers. ASR Send. Reduce fallout with automated pre-validation and data enrichment before orders are submitted. Neustar pre-populates select fields to ensure critical data elements are accurate and complete before they reach the Neustar ASR clearinghouse to maximize accuracy and reduce fallout and delays caused by manual corrections and processing. ASR Receive. Access sellers automatically receive a receipt of incoming ASR orders. ASR responses are automatically generated and sent to wholesale customers connected through Neustar via the XML API. Neustar Order Insights™. View order status data online and on demand. Buyers and sellers gain insight into order data to reduce the number of calls, spreadsheets and staff time expended to track and manage orders. Neustar TroubleAdmin™. Shorten the chain of reporting and resolving trouble tickets with the originating carrier through a single interface to multiple providers. Report on circuits, facilities and network elements. Analytics and Reporting. View patterns and trends to gauge fulfillment time and ordering efficiency. Dashboards use near real-time data to display order volumes by request/service type, volume by trading partner, state of orders, order version and supplier response days. ASR Managed Services. Our experienced team of access experts manage complex orders, relieving your staff of the time-consuming process of managing order fallout. When an order fails at submission, Neustar corrects the order and resubmits it on the customer’s behalf. Access Services Subject Matter Experts. Neustar SMEs bring over 30 years of access ordering experience and industry knowledge, including requirements for complex Ethernet orders, Meet Points and OCN hierarchy, as well as membership and participation with the Ordering Billing Forum and the Metro Ethernet Forum.